Only Dita goods purchased from an AUTHORIZED DITA USA RETAILER are covered by warranty. DO NOT HIT ANOTHER PLAYER'S STICK AND DO NOT LET THEM HIT YOUR STICK. CHIPPED PAINT IS NOT A WARRANTY ISSUE. When sticks' impact one another, the sticks paint usually chips. However, paint chips do not affect play. DO NOT HIT OTHER PLAYERS STICKS AND DO NOT LET THEM HIT YOUR STICK. 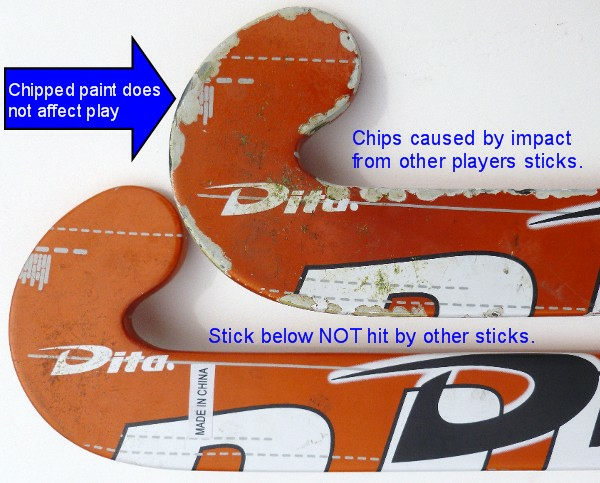 So how can you avoid stick contact? Stick on stick contact is not part of the sport. There is no benefit to hitting another player's stick. It hurts both sticks and doesn't give you possession of the ball. Make a conscious effort to hit only the ball. Become a better tackler. Watch how the top players avoid having their stick hit by other players by releasing the ball sooner. © 2019 Dita. All Rights Reserved.